This this week's CAS challenge on Splitcoast is a sketch - yippee! There were so many possibilities with this sketch and I had several ideas. I had a hard time decided which idea to pick, so I may even make more than one card with this challenge. To see the original sketch, click here. This came together pretty quickly - the hardest part was deciding which circle to put where in the pattern. 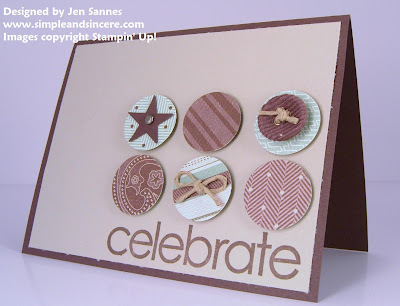 I absolutely LOVE this To the Nines textured dsp - it is so classy and perfect for masculine cards. This is awesome---I loved it when I saw the challenge and love what you have done with it! Great card! I, too, have that circle punch and never know how to use it! This is PERFECT! Love the "woodsey" colors. Great masculine card. Very clean and crisp. I really like the design of this card...a perfect way to use up scraps! FANTASIC guy card!! Love the use of punches and CAS ideas... SO adorable!! WOW, con'grats too on this being your blog anniversary month... and all the blog candy give always! !